NASA is developing the next generation of suit technologies that will enable deep space exploration by incorporating advancements such as regenerable carbon dioxide removal systems and water evaporation systems that more efficiently provide crew members with core necessities such as breathing air and temperature regulation. Mobility and fit of a pressurized suit are extremely important in keeping astronauts productive, so NASA is focusing on space suit designs to help crews work more efficiently and safely during spacewalks. 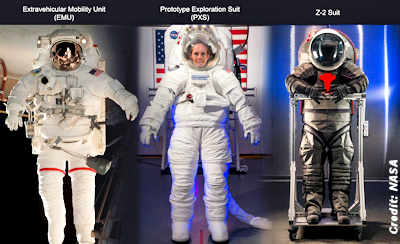 NASA is evaluating pressurizable space suits for missions to a variety of exploration destinations. The EMU (operational spacesuit on ISS) is pictured above on the left, the PXS (advanced prototype) is in the middle and the Z2 (advanced prototype) is on the right.